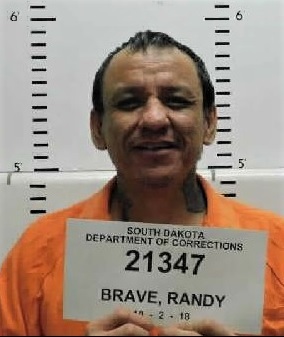 PIERRE, S.D.- Inmate Randy Brave failed to return to Rapid City Community Work Center from a funeral furlough Nov. 17 and was placed on escape status. Brave is 40 years old, Native American, 5 feet 10, 210 pounds with black hair and blue eyes. He was last seen between Wood and White River. Brave is serving a 2-year sentence for eluding a police officer and 5 years with 2 years suspended for possession of a controlled substance out of Pennington County. Failure to return following assignment or temporary leave constitutes 2nd degree escape, a Class 5 felony with a maximum 5-year additional sentence.